YoYos a la Mode in print. We've kidnapped Rachaeldaisy and have been chasing butterflies and following rainbows. Now we've taken her on a picnic in the woods so we'll be away a little bit longer. She asked us to say a big thank you to all those have checked in on her to make sure she's alright. It's nice to know she's missed. Be assured it won't be long until she's back to her regular blogging. 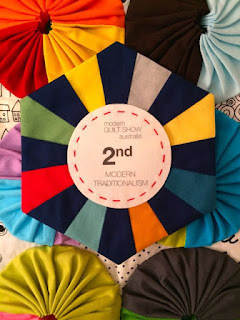 you'll find the pattern for her Yo-yo's a la Mode quilt. Beautiful styling as always. Quilters Companion always manage to find the right place to photograph their featured quilts. 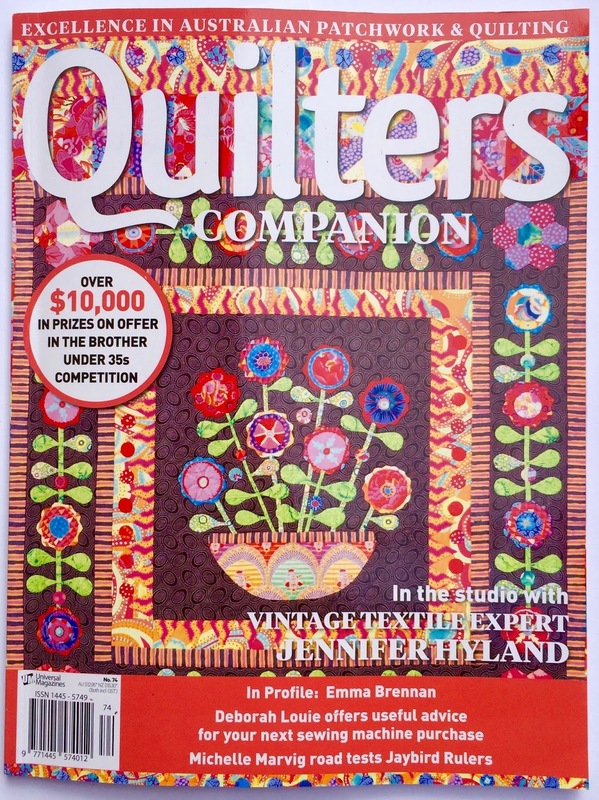 Quilters Companion is an Australian publication so although it's easy to find in our local newsagents I'm not sure about the availability of the magazine overseas but you can download copies digitally here at Zinio. You can read more about this quilt and how it won second place in the Modern Traditionalism category at the Australian Modern Quilt Show in a past post here. Thanks for being patient and see you soon for lots of blogging fun!! Glad to hear our darling Rachael will be back soon. 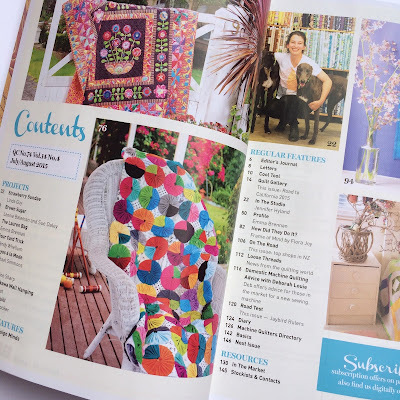 So fun to see that quilt in a magazine spread! Enjoy that whimsical picnic and all the other adventures while you're away from blogging. This makes my heart sing! Not that these cute little thugs have kidnapped you -- but that you are in another publication! You deserve every success, my dear! Watch out for that kewpie! Please tell Rachael "congratulations!" on another magazine cover. Her quilts are so original, creative and happy, they really deserve loads of attention. Don't you think? I was only thinking of Rachael yesterday. Please pass on my best wishes. And her helpers have done a lovely job of this blogpost! Who knew Barbie and Kewpie were so clever! 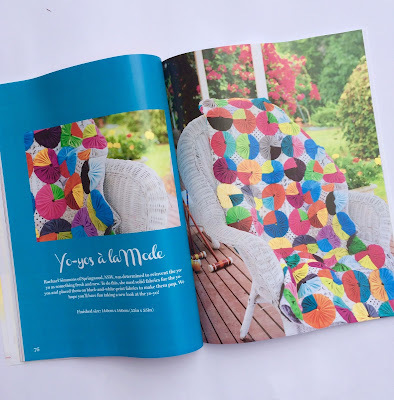 I'm joining the girls in celebrating another wonderful quilt in print. It's great that lots of people get to share your work. Awesome! 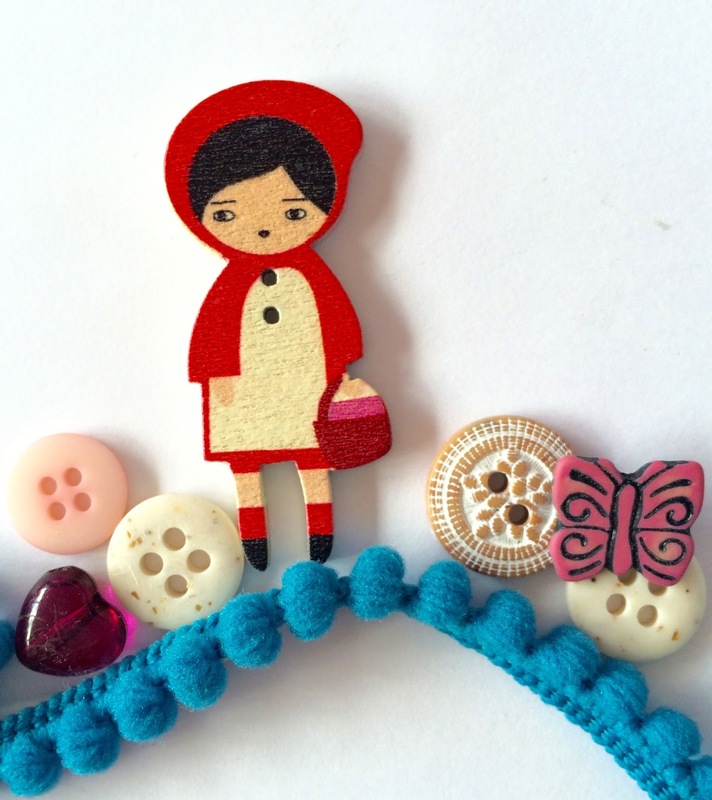 Now keep following that little bobble and button trail to find your way home. Missed you! Over Blue Mountains and into the woods to grandmothers house you go ! LOL I haven't been blogging much either, just sewing for charity events mostly. I have got to tell you (again) how much I always love your photos!!! Yo-yo's a la Mode looks beautiful draped over that lovely chair. What a fun and HAPPY quilt!!! Hope you're having a good "break"! Very excited that your absence has been due to wonderful things and not something yucky like work! Lovely to see your beautiful yo yo quilt in Quilters Companion. It certainly is shown off to its best. Hope you are having a nice break. 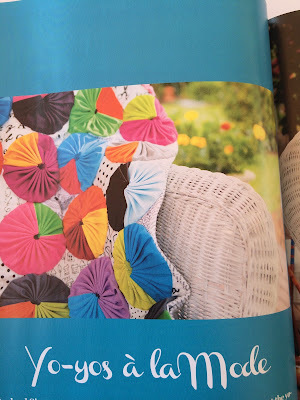 Oh I love that quilt! Looks amazing in the magazine. I will look for it here! Im glad your okay. I have been wondering where you have been. Chasing rainbows and butterflys sound perfect. lovely! you deserve a break, 2nd honey moon...whatever! I give up! 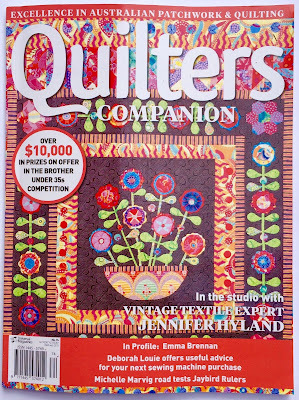 I cannot get that Quilters Companion anywhere. I don't belong to Facebook and that is one place to get it and the other site wouldn't accept my pay pal.......GRRRRR I aught to be able to make this up !!! Thanks kids, nice to know Rachael is ok and I look forward to reading more when she's back on deck. You look after yourselves now - no mischief while Rachael is absent! I hope you are spoiling Rachael at your picnic. We have missed her cheery blogging. 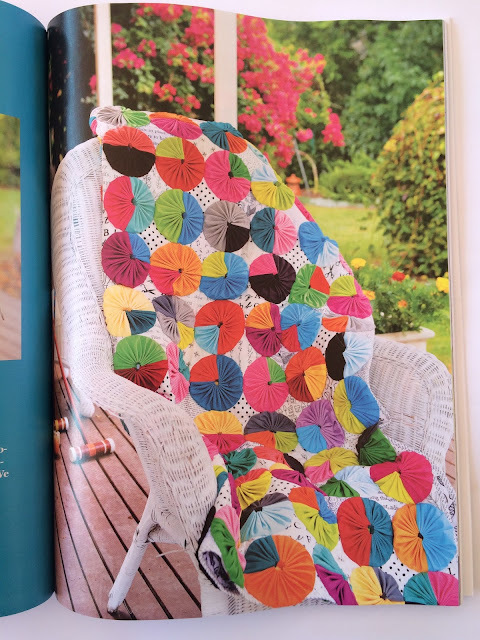 Loved seeing her quilt in print. Best out of office blog post ever! Thanks for checking in...enjoy your time away! so happy to see your pattern in QC ! I walked into my newsagents last week and picked up the latest Quiltmania !!! I was so shocked to see it in my little newagents I jumped for joy - of course the owner now thinks I'm a bit mad !!! enjoy! cute post I miss you but I know you're enjoying yourself. 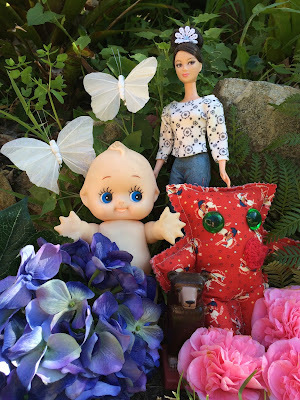 Love your dolls and your quilt looks amazing. Woohoo what a wonderful way to get kidnapped...and such fun! A big Congratulations on the magazine RAchael! Hope you enjoy your break and get to do lots of sewing in the meantime! Another magazine feature...congratulations!!! !